An original Albanian card game played by 2 or 4 people called Pishpirik, has been launched on Facebook by a new game development startup from Kosovo called Puntoria, targeting millions of users on the biggest social network in the world. While Zynga has achieved to have over 38 million players around the world in its popular game Zynga Poker, which is also available for Facebook as well as Android, iPhone, MySpace, Tagged and Google+, Puntoria aims to tackle a bit of that market share, while it already achieved to have over 4,000 registered users in just two days after it’s official launch, and statistics are quite impressive on the number of active players – according to the game developers averagely 500 players are active per hour. One of the founders, Floriment Klinaku says that the concept being developed behind Pishpirik, is not just to ship an active social card game, but to develop team formations, create tournaments and integrate in-game buying options as a source of income. Puntoria, aims to develop further card games in the future, while it also has plans to launch the game on iPhone and Android, in the near future. Puntoria is one of the tenants of Innovation Centre Kosovo, and has been part of the business incubator since 4 months now, and it’s aiming to launch products focusing on Eastern European countries. 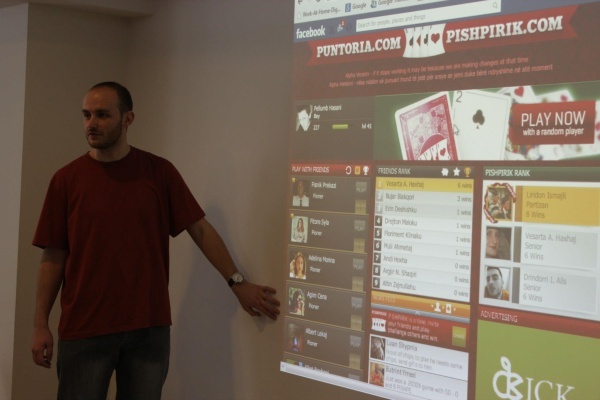 What is worth mentioning is that Pishpirik is not new on the web in the Balkan area, since igrajmo.se one of the biggest game sites from Serbia, has offered the game to hundreds in the region, but in general there was never a good integration with Facebook, and this gap looks like it has been filled by Puntoria.